Niagara-on-the-Lake has been a prime tourist destination in Ontario for almost 40 years, with its proximity to the famous Niagara Falls, closeness to the US-Canadian border, its location on one of the Great Lakes, the wineries and the orchards, the view of the Niagara Escarpment, finally the town itself: three theatres, plenty of restaurants, numerous resorts, spas, bed and breakfasts featuring jacuzzis, fire places, verandas and unique meals in the perennial gardens. The town and its main street are buzzing with tourists, plenty of Americans, numerous Europeans and even some from far away lands like Japan and Hong-Kong. The Chamber of Commerce is very helpful – as always – in sending the Visitors Guide and assisting with accommodation, be it Pillar and Post, Oban Inn or a B& B. Their web site is www.niagaronthelake.com and phone number is 905-468-1950. The Magic Fire, written in 1997, deals with displacement and nostalgia of Argentina in the 1950’s at the time of the death of Eva Peron. Following the opening statement "I am an immigrant in a country of immigrants – a stranger everywhere", it took about 3 minutes for the audience to finish applauding. Obviously it struck a cord in their hearts. Both the writer of the play, Lillian Groag and the director, Jackie Maxwell are immigrants themselves, and experienced the process of departure from one country, arrival in another, unavoidable assimilation, equally unavoidable retention of the past and living with it. Maxwell was born in Ireland and came to Canada in the 70’s, Groag was born in Argentina and moved to the States in the 60’s. Clearly, they both know the experience. This is the first staging of The Magic Fire in Canada. There isn’t much of a story, rather it is recollections of two families: the immigrants from Italy, the Guarnieris, with their broad Italian accent and unmistakable mannerisms and the immigrants from Vienna, the Bergs, with their German accent and love for Wagner and Mozart. They are joined by marriage and spend time together listening to music, celebrating holidays, being on the alert for outside noises of police searching for individuals opposed to the present day regime. 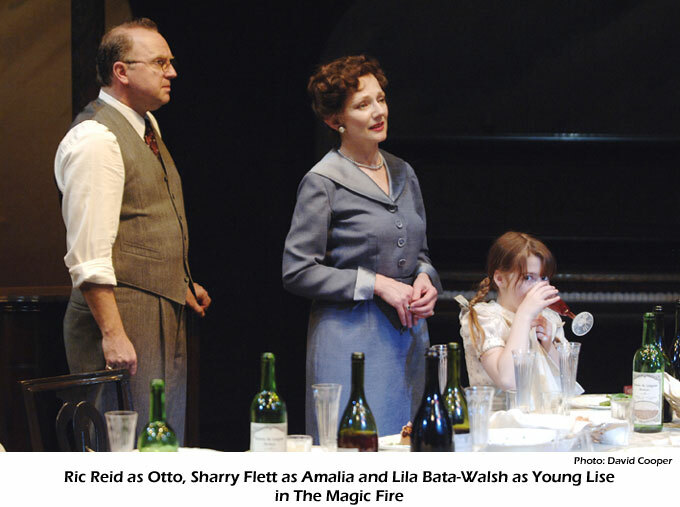 It is a play of memories, like looking at family photos with the music woven into the background. Without the music there would not be The Magic Fire, as the title is adopted from the Wagner’s opera, Der Ring des Nibelungen. The acting is superb; the music eats into your heart. Worth special mention are actors Michael Bell in the part of Gianni Guarnieri (it is amazing how Italian he becomes!) and Jennifer Phipps as Nonna – in her 26th season with the Shaw, she is absolutely magnificent! If not for any other reason – you should see it, as an immigrant living in a country of immigrants. It is the feast for the eyes, for the ears and for the soul. It runs till October 8 in The Court House Theatre. Design for Living – another great comedy by Noel Coward. 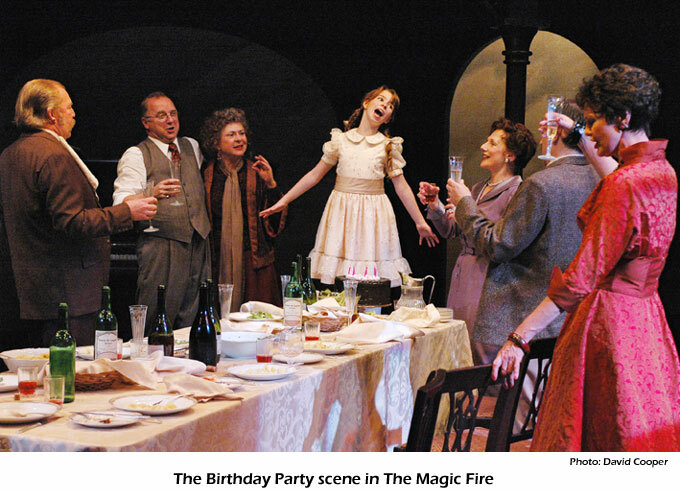 The Shaw Festival is successful in returning to Noel Coward’s plays - at least 9 performances in the last 20 years. 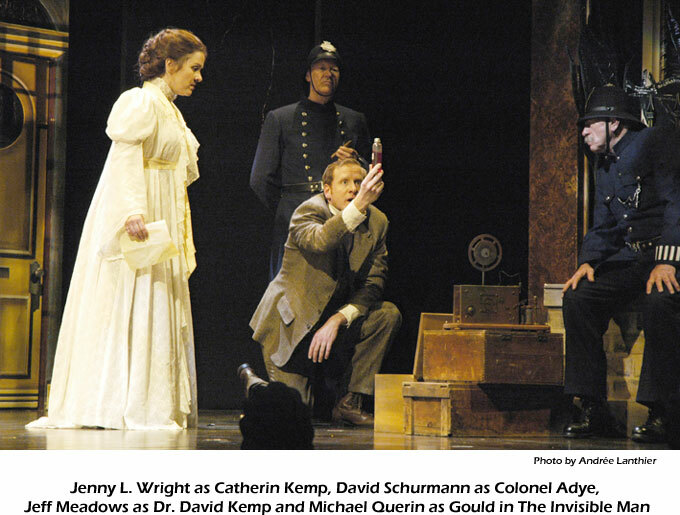 Among them Cavalcade, Blithe Spirit, Easy Virtue, Hay Fever, Present Laughter. It is always a pleasure to see one more of Coward’s comedies, somehow they have some depth and some surprise. Design for Living, written in 1932 is one of the best, the cumulative and final result of Coward’s collaboration and friendship with Alfred Lunt and Lynn Fontanne. At first glance it is a delightful comedy following the changes in love interests of Gilda, Otto and Leo. Initially Gilda is in love with Otto (Paris setting), then Leo comes into the scene and Gilda lives happily with Leo (London setting), then Ernest comes into the picture and Gilda loves Ernest (New York setting) and then Otto and Leo come after Gilda - because they love Gilda and want to be happy together. The stage settings of Paris, London and New York, by Ken MacDonald are innovative in art nouveau style, simple silhouettes of the landscape so well known and characteristic of those cities. 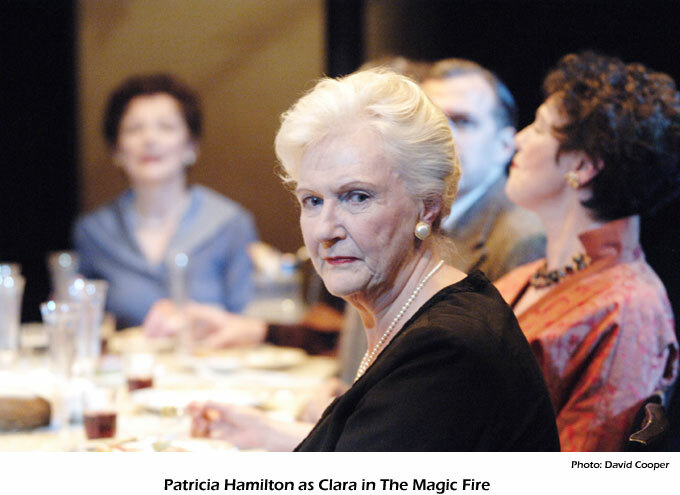 The director is Morris Panych, well known and highly acclaimed in Canada. Really, we could not wish for more! In the 30’s when The Design for Living was staged for the first time the general public was not ready for the double meaning of this love stories. It was just a comedy of a free-living woman changing lovers. 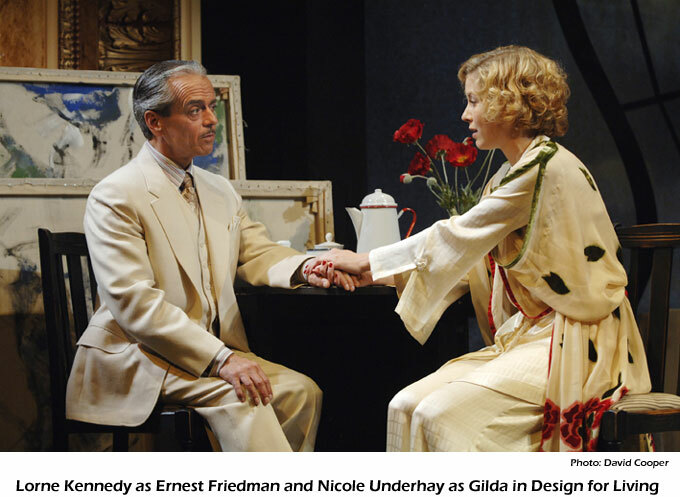 In modern days it shows through that the triangle is not just Gilda versus several lovers, but Leo and Otto as well. Lucky for us and the comedy there are no unnecessary issues of jealousy, resentment, possessiveness or logistics of changes in life locations, they love, laugh, enjoy themselves and face no social issues. As long as you are happy, give each other joy – what a design for living it is! Somehow the lifestyle of having multiple partners or bi-sexuality is not an issue, (why am I even mentioning that?!) it is loving and being together with what is. Just be kind to each other, enjoy life and all the best to all! Nicole Underhay is Gilda, Otto is Graeme Somerville and Leo is David Jansen. Incidentally Jane Johanson as Miss Hodge is great. Just an added pearl in a great performance. 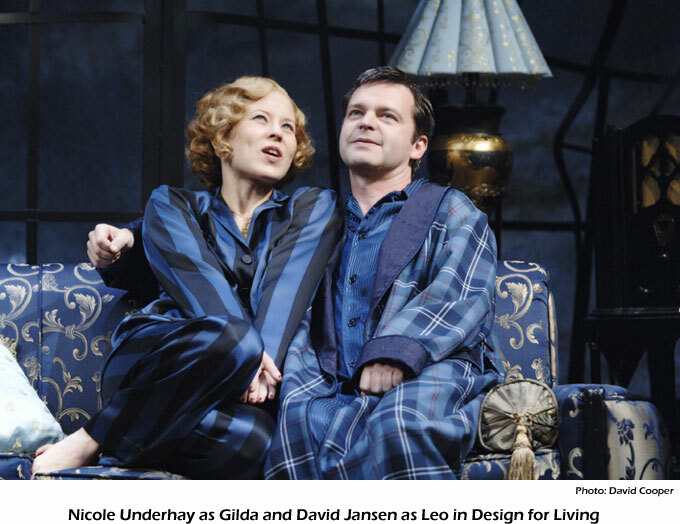 Design for Living continues at Royal George Theatre until November 18. The Invisible Man – as based on H.G.Wells book. At the end of the19th century, in the spirit of discovery and an appetite for science, a young man performs a scientific experiment which causes him to become invisible. The fantasy becomes a reality and in the very British village his life becomes a nightmare. As he is attempting to reverse the results of his experiment the locals fear him and try to run him out of the village. His long time friend, who meanwhile married his long time girlfriend, is attempting to help him (or not) and there is a slight romantic element inserted into the plot. The setting is lovely, with very British pubs and very British accents, - at least some of the villagers display it with real gusto, while some others do not. The story was adapted by Michael O’Brien and directed by Neil Munro. It has some interesting special effects, such as, how to make a person invisible on stage. It is entertaining and very suitable for a younger audience. Somehow it lacks punch or a satisfactory conclusion, or a moral to this experiment. It is hard to tell if this is the story itself or the production, or maybe I expected more from H.G.Wells. The conclusion is "Be careful what you wish for!" 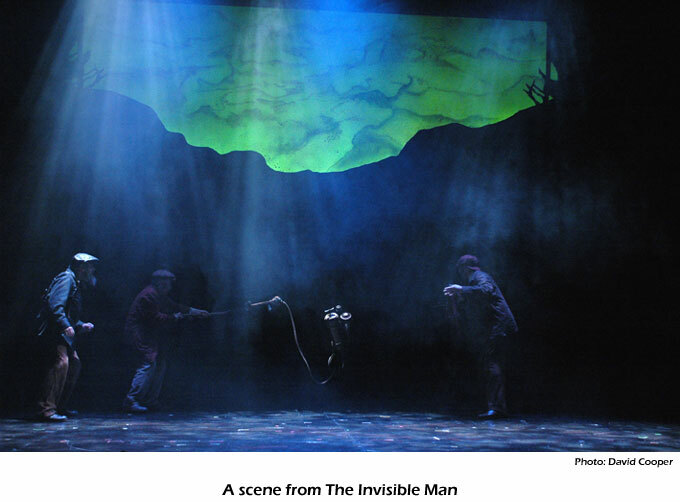 The Invisible Man runs at the Royal George Theatre till October 29. The Festival box office is 1-800-511-7429, web-side www.shawfest.com. Looking forward to the new plays and concerts in the Fall!